The stress that comes with planning a domestic and much worse, an international trip with your family, group of friends, or coworkers is unmatched. The initial planning stage of where to go, what hotel to stay in, how long will you stay for, what activities do you do, and so on is the most stressful stage since this is where the itinerary for the whole trip is decided on. This is also the deciding factor for how much should each of person going to the trip allocate financially. You may also see material list examples. When you and your group has decided on where to go for vacation, you immediately start to look for the best activities to do while you all stay there, the best restaurants and food markets to eat in and also what hotels or inns you can stay in for the low. You immediately scour the Internet for the following but more importantly, for cheap hotel, villas, etc., deals since it will be too expensive especially when you have five or more people going on the trip. When traveling with a group, you need to make sure that everyone’s preferences are heard and that a compromise is reached by the end of all the planning period. It should be a priority to have people decided who they are comfortable sharing a bedroom with so that hotel or room arrangement is made prior to the trip in order to book the rooms in advance. You may also see to-do list templates and examples. Therefore, planning and actually calling in for the reservations for the place you all decide to stay in should be immediately done in order to secure a safe and comfortable place before you head out and enjoy your vacation. When you are the organizer for a family, friend trip, or an official business trip, you need to make sure that the place where the participants for the trip has already been booked weeks or even months before the actual trip. However, you also need to make sure that you assign each participant on a room they prefer and with a roommate/s you know they are comfortable with. 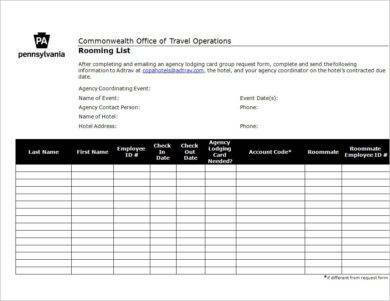 One way to make sure that this is all smoothen out prior to the day of the trip is sending in a rooming list to the hotel or to any establishment where you will all stay in. You may also see list templates in word. 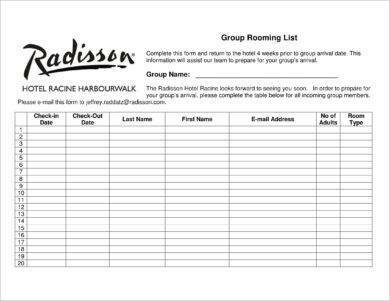 A rooming list is a printed or electronic list or roster of guests and their lodging needs and preferences presented to a hotel prior to a meeting or a trip. It is usually sent out by the organizers and/or their designates to hotels or other housing facilities in order to deliver multiple reservations. It is given to the hotel so that the hotel management can arrange and reserve the rooms within the room block of the list before the attendees arrive on site. You may also like birthday list examples. A rooming list is usually used when there is an official business trip, seminars, or trainings that require in-house lodging. 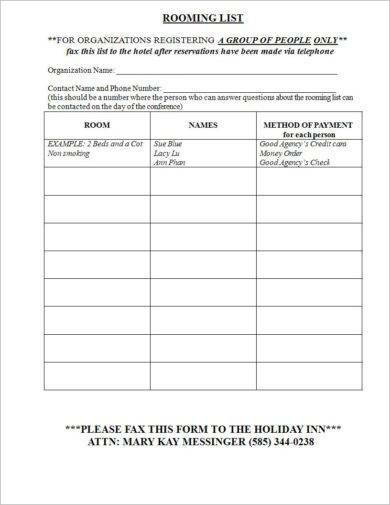 The information included on the rooming list are usually gathered through a form the attendees complete prior to the convention. Commonly, a rooming list includes information such as the first name, last name, arrival date, and departure date. 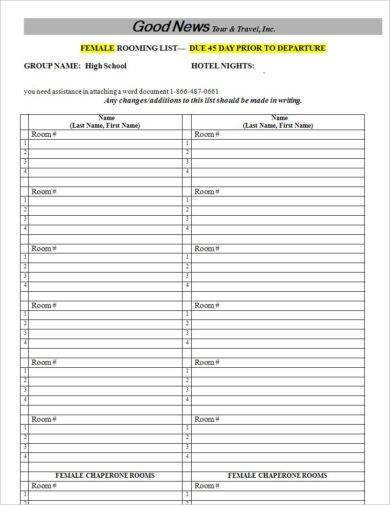 The rooming list is an important document that should be given to the lodging establishment prior to the event because it ensures that each participant has a room to stay in during the entire duration of the event. In addition, it will also serve as a blueprint for the rooms that should be located relevant to each other. You may also check out contact list examples. Also, since official business trips and events conducted by an organization or company requires proper liquidation of funds, the rooming list can help justify that the exact number of participants included on the budget is also the same number during the day of the event. You might be interested in inventory list examples. 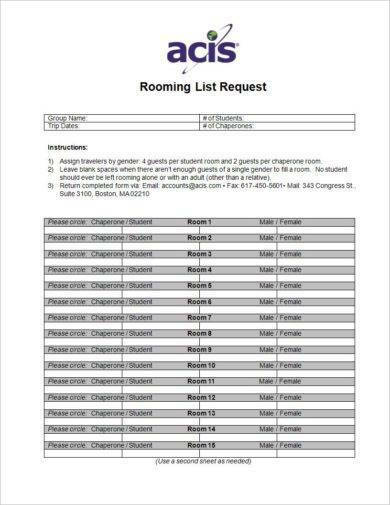 Since a rooming list is an important document that will help with the room assignment during a trip, it must be filled out properly to make sure that the lodging facility clearly understands the listed information so that they can carry out the request without a glitch. You may also see packing list examples. Handwriting the information to include in the list may be misinterpreted since there are some handwriting that are difficult to read. This may lead to disorganization of room assignments and cause utter chaos on the day of the event. In order to avoid such issue, it is better to type out the room lists and save it to your computer.You can easily and efficiently send it via professional email to your travel consultant or organizer so that they can arrange the reservations to the lodging facility. You have to understand that each block reflected on the rooming lists is considered as one room. Therefore, if attendees are to be assigned on the same room, say four people are assigned on the same room, their names and other information should be typed out on separate lines within the same block. You have to do this step until your attendees are all assigned with their roommates and specific rooms. You may also like management skills list and examples. You place the attendees on the rooming list where you want them in relation to where you want them to be on the hotel floor. For example, if group number one is located on the first room and you want group number three to be the group next door, you assign them as how you want on the rooming list. After that, you should request the hotel or lodging facility to maintain the order, but there’s no guarantee, at least they will still work to maintain the requested order of rooms. You may also check out attendance list examples. 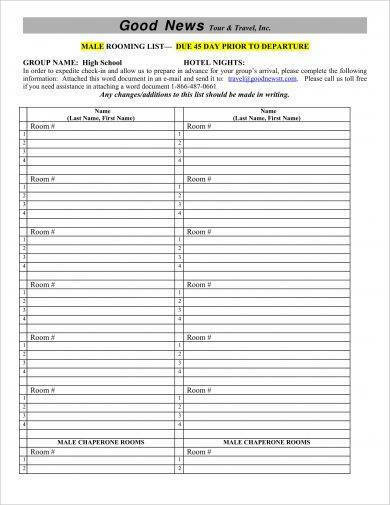 For student trips, avoid filling out the first and last blocks of the rooming list for chaperones because that way you will end up with having the chaperones on the end of a hallway. In order to maintain effective supervision, intersperse chaperone rooms among student rooms; meaning you need alternate chaperone and student rooms. You have to remember that the lodging facility will view your rooming list as your desired room arrangement, therefore, you should carefully plan the layout of the rooms. You might be interested in vendor list examples. Doing this on your rooming list will make it easier for tour leaders and nighttime security to find your room should an emergency arise. This can be done in such a manner, for example, JOHN DOE – CHAPERONE. Aside from that, lodging facilities will want you to know which rooms have students and which rooms have adults. You may also see how to prepare your email marketing list and profits. The rooming list will help you make sure that you book the right rooms in advance and that if there are previous reservations before you, you can reorganize the arrangements for the rooms. 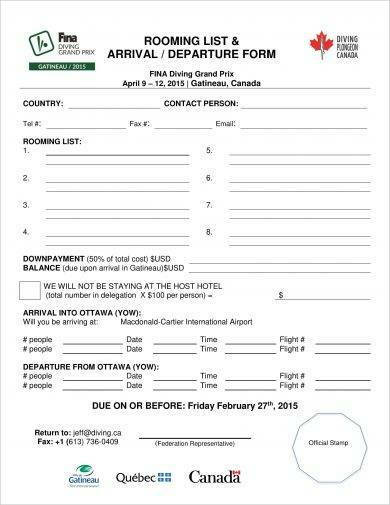 Therefore, it is extremely important to send the complete rooming list 45 days prior to the departure for the trip. This will finalize the reservations for the said trip. 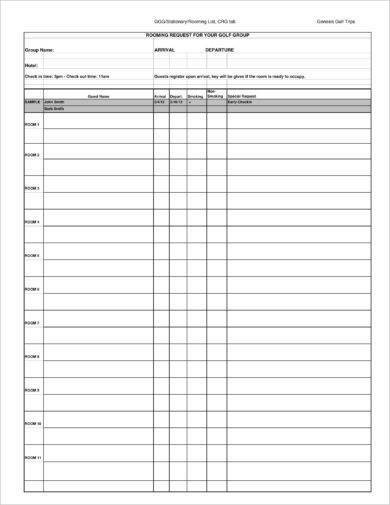 You may also like medication list examples. 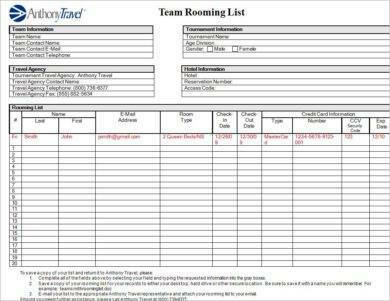 It is very time-consuming and overwhelming putting together a rooming list especially when you are not really familiar with the entire process. 1. When the budget can be stretched, opt for flats or double occupancy rooms with 2 beds so that you can save more. 2. If you follow the first tip, look for lodging places that offer a shared living area and kitchenette while having bedrooms with its own bathrooms to ensure maximum privacy for each guest. You may also see price list templates and examples. 3. It is important to reserve enough rooms for the participants but not so many that you still have to pay for unoccupied rooms. 4. You can use previous room allocation if the same lodging facility is being occupied to compare it to number of nights the rooms were actually used. This will help you plan how many rooms to book and for how long. You may also like wedding guest list examples. 5. Assign participants that you know or you can tell that have the same sleeping pattern. Group night owls together and group early sleepers on the same room to make sure everyone is satisfied with their room assignments. 6. You most definitely need to factor in physical challenges into decision-making in determining which rooms to assign for each guest. Some will required to be accommodated on the lower floor or rooms that are close to the elevator. You may also check out grocery list examples. 7. It is apparent that you join together in the same room participants that need special accommodation. 8. Contact the venue regularly to make sure attrition is kept into a minimum. In addition, contact participants regularly to make sure there are no surprises or unhappy participants on the arrival date. You might be interested in how to use your email list to raise more money. 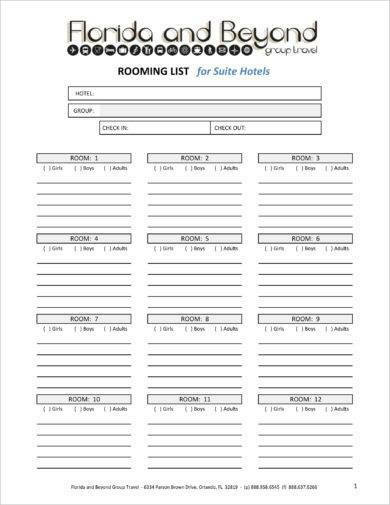 A rooming list is an important document that will help you plan out the hotel reservations for your guests and/or participants on business trips, seminar, and trainings. It will help you as the organizer have a better way to communicate what your participants want in terms of their accommodation. This will help you make sure that your attendees can have the most out of their stay during the entire trip. You may also see punch list examples.